The below post was inspired after reading two recent and lovely pieces by Michelle and Sherry. And also a short trip home. 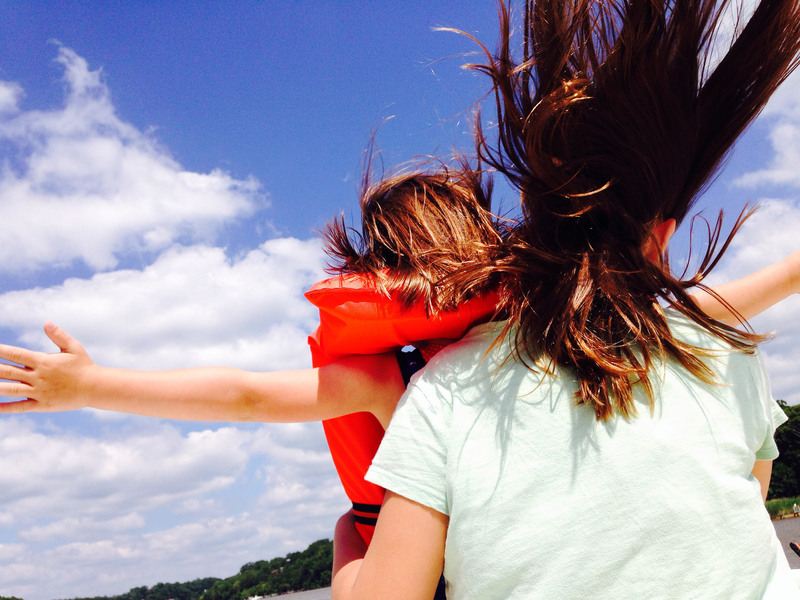 While watching my daughters reenact the “I’m Flying!” scene from Titanic on my dad’s boat, I realized I don’t hum on boat rides anymore. It was a bittersweet moment. I’ve always hummed involuntarily on boat rides and took it as a sign I could be deliriously happy at sea no matter my state on land. Watching my girls goof around and sing, I felt like I’d passed the baton. We cruised past an eroding strip of undeveloped land, my dad at the wheel. I could see a tramped down path in the bluff above, but I’ve never seen another soul up there. My dad told me he’s recently walked along the trails, which branch out like fingers. He asked if I ever explored it as a kid, and incredibly I hadn’t and stopped to think how that could be. Then I remembered Old Man Jenkins. Jenkins wasn’t really his last name and his real name was actually more fitting, but he’s long gone so let’s just let him rest. He was an ornery old fella when he was alive and who knows what his ghost might be like. The real reason I never explored the bluff was fear of death by shotgun. Neighborhood legend was that he once shot at some kids who wandered onto his land, which was only separated from our neighborhood by a tall chain-length fence strangled with ivy and weeds. Jenkins ran some kind of ship repair shop or hospice for dying boats and he lived alone on an overgrown compound on at least five acres of prime waterfront real estate. He could have sold it and bought himself a house on the Riviera, but I guess he liked his spot and I can respect that. The town where I grew up has always been a mix of newcomers who just want a pretty water view and people who stick around for what time hasn’t been able to change. It still has the same old country store my parents didn’t want us going in as kids because it was dirty or the clerk surly or prices jacked too high or all of the above. The post office and fire station look the same from the outside and I can still picture the inside of the fire hall from that neighborhood dance in 7th grade when I was allowed to wear eye shadow and mascara for the first time and felt beautiful for two solid hours. My brother used to walk home late at night from his dishwashing job at the crab house and sometimes burnouts from the rougher neighborhood threw things at him. Once he got pelted with the letter E from our nautical-themed neighborhood sign. It wasn’t class warfare exactly, but there was a clear divide between new neighborhoods and old. Several decades later, all the neighborhoods are old and waterfront lots are scarce. People with money will buy up anything, tear it down and put up window-covered castles on postage stamp lots. Jenkins’ old land sold and has a handful of new carriage homes on it. I don’t think he would have cared for anything called a carriage home. The undeveloped bluff has to stay that way, according to my dad. For the record, I don’t think Jenkins ever shot at anyone, but the rumor kept me out. I imagined him poised at a murky window, his sweaty, nicotine-stained finger twitching close to the trigger, his eyesight not all that great but his hearing pretty keen. I love visiting my parents and smelling the brackish tides and watching osprey carry off long sticks to nests high above. I love visiting “home” but the place I miss isn’t here anymore. The kids are old now, like me, and most of them gone. The woods we played in are long gone too, except for that bluff I never went in anyway. Now I want in. We were only visiting for one night and most of a day, so there wasn’t enough time for trespassing. There was barely enough time for a boat ride and a swim in the creek, but we managed both. By we, I mean the collective we. I stood barefoot on the pier with my sweet baby nephew while my girls and dad swam in the silty brown water below. I paced to keep the bottoms of my feet from burning as they waded in to water that was still cold but sea nettle free. Soon they were swimming and splashing around. My dad offered a bounty to anyone able to locate the sturdy wooden rocking chair that blew off the pier in a big storm a couple of months back. My girls felt around tentatively with outstretched legs and arms in the murky water and tried not to think about what else might be down there. Somewhere nearby or far away or who knows really, the rocking chair laid on its side, already fuzzy with algae and forgetting what the warm sun felt like on its softly silvered wood or the sound of unmuffled squeals of girls or rumble of motorboats and other things that had once been home. He might know where it is, but he’s not talking. I’m giving up writing now that I read this. Beautiful. Touching. I am there. Felt and heard it all. I want to sit in that rocking chair. I am going to eat a box of cookies now. Thanks Paul. I’ve felt that way about things you’ve written. Childhood memories make for rich material. Now pass the cookies. There is SO much to this story. 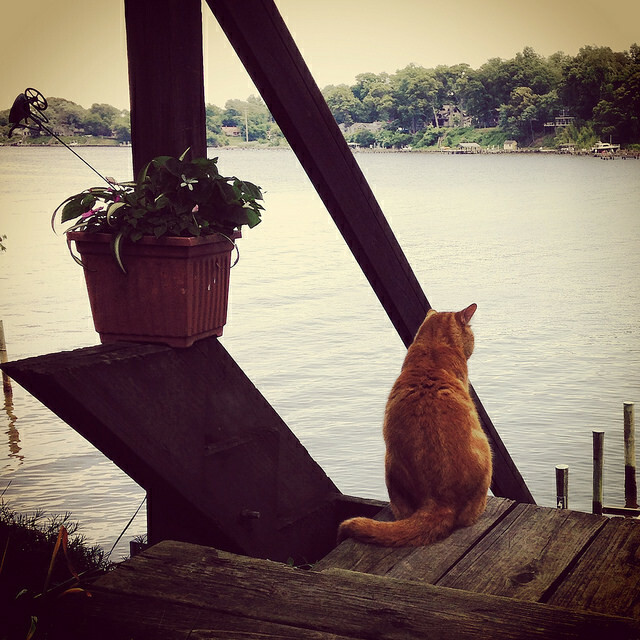 I love how you took us with you on every meander and wave that your heart visited while you were at home. I loved the reference to blue eye shadow and feeling beautiful in 7th grade. An adventure up to Jenkins’ place that I would have traversed with you. Visions of your girls and daddy in the water…and everything that last paragraph means for anyone who misses what once was home. Bravo! You are possibly the kindest commenter out here in WP, Michelle. Damn inspiring. Thanks Michelle! I agree with Paul ‘s comment – your comments are so sweet and thoughtful! Wow, you can sure paint a picture. We had an old man Jenkins too, but he guarded a pomegranate grove. You’ve described perfectly that longing for something that doesn’t exist anymore but lives so clearly in your mind. It’s interesting that even though it’s not the same place where you grew up, your kids are going to form their own memories of it just the way it is now. Beautiful post Kristen! The pomegranate grove made me think of Mr. McGregor’s garden. And yes, they will have their own memories and that is what keeps us going down for visits on otherwise busy weekends. Those visits are more about the people than the scenery. Kristen, you said in an earlier post you are still trying to decide what you want to be when you grow up. I hope you are considering being a writer, you you’ve got some mad skills, girl! This one’s a beaut, and I thank you for sharing it with us! Thank you, Josie. I’ve always admired your writing skills and ability to tell a story. evocative and bittersweet and hopeful and lovely, just lovely. I wish there and been enough time for trespassing…. This is a bit off -topic, but I am only one week sober, and honestly, could not have gone two days without this website. Truly, thank you all. But I am feeling so vulnerable, and would like to find an AA meeting. How does one go about this? And, do I have to talk, or can I just listen? Thank you. Hi Donna! Thanks for stopping by. Congrats on your sober time! There are generally a number of meetings in any given day within a short drive. You do NOT have to talk if you don’t want to. You can just listen. I would bring $1 to contribute when they pass the basket around. Meetings helped a lot in those early days. Met some of the nicest people there, much like in the sober blogs! There are also online meetings available through that same link. Good luck to you! Also, if you want to chat more on meetings or anything else, please email me at byebyebeer@gmail.com. Thanks! Great story. Thanks for a wonderful post! Really appreciate you. Haha!! Wait, does every town literally have an old man Jenkins? Ours wasn’t that cute, but still. Hilarious! Kristen, this is beautiful. As I read your wonderful words, I found myself thinking of my home town, about little things that were kinda nice about living there. It was a much smaller town than yours, by the sound of it, but it, too, was situated on a lake. If I had known you then, I would have totally gone walking on those trails. I was just that kind of rebel. We had Old Lady Arnold. One Halloween night she turned out her lights, but we all knew she was home – we could see the glare of her TV. We talked about how mean she was to do that, and someone should go to her door and knock anyway. Every home town must have an Old Man or Old Lady so-and-so! The resident curmudgeon. I’m glad you had a nice trip back, and even happier that you shared it with us. I was drawn to the kids who were cool with a little trespassing, so if we ‘d been friends, I’d have a better story to tell here. And I adore reading your posts about childhood. I’m not sure which I love more…this beautifully written, touching poignant post…or your interaction with Donna. Both have touched me deeply this evening. Oh yes…and I’m glad I do. You’re so good at writing.. So good. Great, even. But you know that, right? Thank you so much, Pizza. This means so much coming from a writer like you. Beautiful. I guess now is the time for revisiting our home places. So hard to see the changes to what we remember as a “perfect for us” place. Why don’t you hum anymore? Maybe you’re just rusty and need some practice.